When does an actor become a person and a person an actor? In Character is a about a man finding his part in the scripts of everyday life. 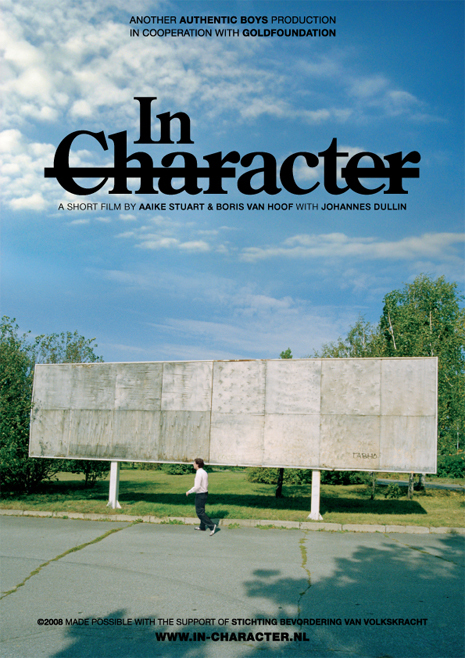 Shot in the streets of Berlin, Rotterdam and Bratislava, it explores the border between staged and documented film. The development and shooting of In Character started performing actions in public space that were so ordinary, that they were hardly recognizable as performances. Throwing away some waste, opening the newspaper, changing shoes, staring through a display window: by endless repetition, the actions were explored on appearance and meaning. Eventually a dramatic film-character evolved. A man whose looks, behaviour and surroundings got out of balance all the time, whose social status and aim were so hard to define, that in the end he borrowed his own identity from it: a roaming soul, searching for his part in the scripts of daily life. Someone who observes, imitates, wants to be seen and gets imitated in the end. In Character includes staged as well as documented elements in which everybody and no one is an actor in the big city setting.